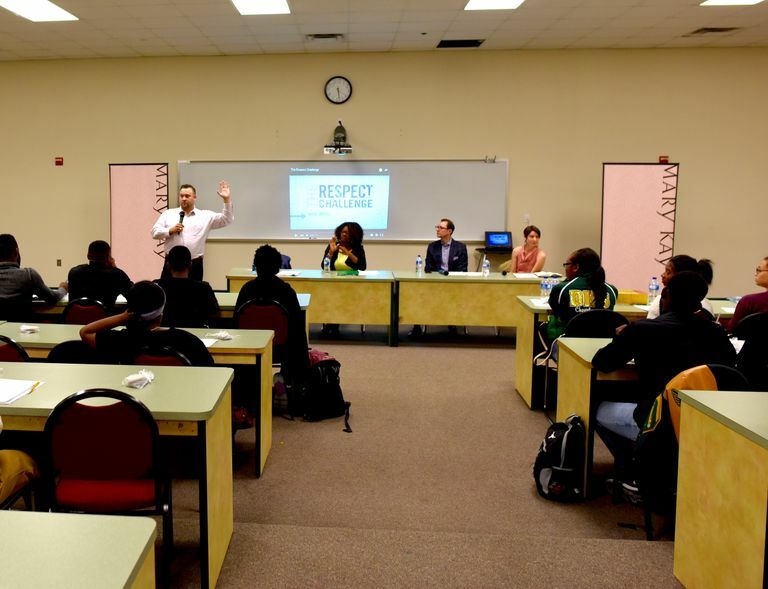 In conclusion of Dating Violence Awareness Month, Mary Kay partnered with loveisrespect and YMCA of Metropolitan Dallas to host a “Healthy Relationships Huddle” at DeSoto High School. During the huddle, student leaders joined in an intimate conversation about healthy relationships, as well as recognizing the signs of abuse. 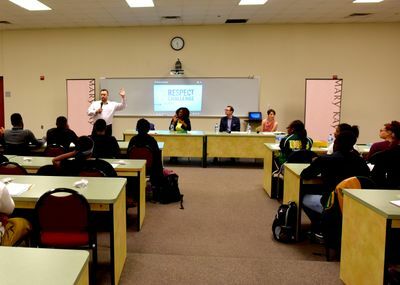 Additionally, students participated in a panel discussion featuring domestic violence experts and advocates. Panel members included: Margaret Halpin, Digital Services Manager of the National Domestic Violence Hotline & loveisrespect; Brian Pinero, Vice President of Development and Strategic Initiatives of the National Domestic Violence Hotline & loveisrespect; Cameka Crawford, Chief Communications Officer for the National Domestic Violence Hotline & loveisrespect; Crayton Webb, Vice President of Corporate Communications & Corporate Social Responsibility for Mary Kay Inc.; and Troy Williams, Youth Development Director for Moorland Family YMCA. This was the first of five “huddles” Mary Kay, loveisrespect and YMCA of Metropolitan Dallas will host across North Texas. DALLAS – March 1, 2016 – In conclusion of Dating Violence Awareness Month, Mary Kay partnered with loveisrespect and YMCA of Metropolitan Dallas to host a “Healthy Relationships Huddle” at DeSoto High School. During the huddle, student leaders joined in an intimate conversation about healthy relationships, as well as recognizing the signs of abuse. Additionally, students participated in a panel discussion featuring domestic violence experts and advocates. Panel members included: Margaret Halpin, Digital Services Manager of the National Domestic Violence Hotline & loveisrespect; Brian Pinero, Vice President of Development and Strategic Initiatives of the National Domestic Violence Hotline & loveisrespect; Cameka Crawford, Chief Communications Officer for the National Domestic Violence Hotline & loveisrespect; Crayton Webb, Vice President of Corporate Communications & Corporate Social Responsibility for Mary Kay Inc.; and Troy Williams, Youth Development Director for Moorland Family YMCA. This was the first of five “huddles” Mary Kay, loveisrespect and YMCA of Metropolitan Dallas will host across North Texas.